Connected Field Service, introduced in the Fall 2016 release of Dynamics 365, combines monitoring with the Internet of Things to replace your costly break-fix service model with a more proactive “never fail” model. With monitoring in Connected Field Service, you always know your customers’ equipment is running smoothly—and when it isn’t. If equipment fails, you’re notified right away, so you can troubleshoot the problem remotely, or send a technician to fix it, often before the customer even knows there is a problem. Connected Field Service is designed with time-saving features that boost productivity. You can register customer assets with the Azure IoT hub, right from the Field Service app or from the mobile app. You can also manage devices by categorizing them—for example by device type, supported commands, or breakdown frequency. You can also view the live heartbeat of registered devices using Power BI. 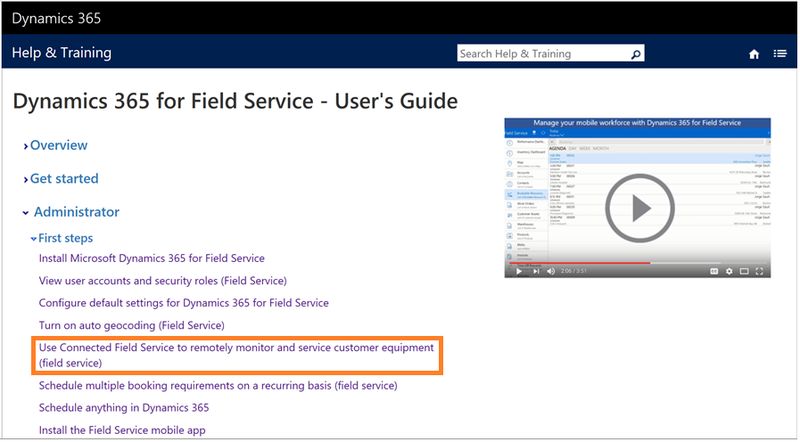 To learn how to install and get started with Connected Field Service, see: Use Connected Field Service to remotely monitor and service customer equipment (field service). Visit the Dynamics 365 for Field Service – User’s Guide page for more information on Field Service. Get the latest info and links for eBooks, videos, onboarding information, how to contact support, and much more on the Help and Training site. Developers can find information in the MSDN: Connected Field Service Developer Guide.